Angry environmentalists launched an online campaign Wednesday urging President-elect Barack Obama to undo a federal rule that clarifies when coal companies can dump mining waste in streams, calling it a long-awaited "parting gift" from the Bush administration. North Carolina-based Appalachian Voices and other groups blasted Tuesday's Environmental Protection Agency decision to endorse the mining rule as the death of freshwater streams and the likely start of a new surge in mountaintop removal surface mining across Virginia, West Virginia, Tennessee and Kentucky. Although the regulation would apply nationwide, mountaintop removal operations are of special interest in Appalachia, where surface mines now outnumber those underground. An EPA study estimated 400,000 acres of forest were wiped out and nearly 724 miles of streams buried between 1985 and 2001 by mountaintop mining, in which forests are clear cut and holes are drilled to blast apart rock. Massive machines, some with buckets big enough to hold 24 compact cars, scoop coal from the exposed seams. The rock and dirt left behind is dumped into adjacent valleys, changing the natural shape of the earth, lowering the height of the mountain and covering streams. The rule, proposed by the federal Office of Surface Mining and expected to take effect next month, would govern how mining companies can encroach into a buffer zone designed to protect streams. The Bush administration finalized the rule Wednesday and it will be published in the Federal Register later this month. West Virginia attorney Joe Lovett, who has filed several lawsuits over mountaintop removal mining, said the rule essentially handicaps Obama, taking away a tool his administration could use to rein in the practice. "For the industry, this is a parting gift," Lovett said. But the National Mining Association says environmentalists are misrepresenting the rule as a free pass for Big Coal. It argues operators will have to conduct even more rigorous, time-consuming analyses of their disposal plans before mining begins. "The rule does not make it easier to conduct mining activities within the stream buffer zone," said NMA spokeswoman Carol Raulston. Dumping excess rock and soil has always been allowed, she said, as long as operators comply with federal water quality laws. Read the Office of Surface Mining's comparison of the old and proposed new rules governing mountaintop mining and waste disposal. "Enforcing a law and removing a law are two different things," countered Naoma resident Vernon Haltom, co-director of Coal River Mountain Watch, an environmental group trying to stop a mountaintop mine and preserve the site for a wind farm. "To me," he said, "it's the difference between having traffic cops that are sleeping on the job and having no speed limit." Lawmakers and the governors of Kentucky and Tennessee had urged the EPA to block the regulation. At issue is how to interpret regulatory language that says surface mining operations can't disturb land within 100 feet of a perennial or intermittent stream. Kentucky Coal Association President Bill Caylor said that if mining operations had to stay back 100 feet from every ephemeral stream - one that grows when it rains and dries up when it doesn't - there would be no place to put leftover rock and dirt. "The environmentalists are misleading the public into believing that this regulation will allow us to dump waste into rivers and dam up rivers," Caylor said. "I don't know how to respond to that. It's just not true." But Appalachian Voices, which maintains the ilovemountains.org Web site, estimates 470 mountains have already been destroyed. EPA's action this week is "absolutely egregious," said Appalachian Voices program director Matt Wasson. "It's just an exclamation point on what we've been seeing for the last eight years. 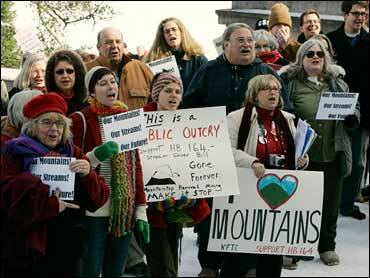 "It's about making it easier for a few coal companies to engage in mountaintop removal." Wasson's group launched a campaign Wednesday urging Obama to stop mountaintop mining during his first 100 days. Comments posted through ilovemountains will go directly to the Obama Transition Team Web site.